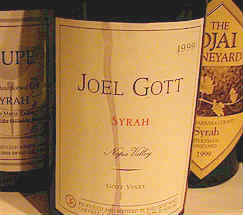 The world of California Syrah is becoming more and more crowded with contestants, as winemakers here see the major red wine grape of France's Northern Rhne Valley as a ticket to fame and fortune. I recall being told by Marcel Guigal a few years ago that he (and his son) felt Californian winemakers were more close to making Rhne-styled wines than those working with Syrah in Australia. We assembled a set of wines from a variety of producers, largely wineries whose wines we've liked previously. Now that we've lined them up and tasted them blind (but not blindly), I am not certain I would identify many of these wines as "Syrah." The question is : does the common 'theme' of Syrah make their spicy elements somewhat 'invisible' or did I (and others) miss something here? We found a set of very nice wines. Some tasters were of the sentiment that these wines don't possess the spice, smoky and meaty notes of many favorite Rhne Valley Syrah wines. On the other hand, there's no denying these are well-made, stylish wines of good quality. I sensed that many tasters felt the $50+ price tags are ambitious, feeling that similar quality wines may be had for $20-$30 in areas such as Zinfandel, Cabernet or, what-the-hell, Rhne Syrahs! Bringing up the rear was the Edmunds St. John Syrah, a bit of a surprise, frankly. No tasters had it to "win, place or show." One critic said "There's something seriously wrong here...the wine is simply defective and is extremely cloudy. It should have been more thoroughly analyzed before being released." Another wag said "Well, it did seem to help my cough." A third taster described this as being reminiscent of "Brettanomyces and grapefruit." Someone else noted "It smelled so bad, I wouldn't taste it!" My first sniff showed some spicy and rather jammy notes. After a bit I recalled it being similar to a particular St. Joseph, showing a decidedly citrusy fragrance...grapefruit. Then it turned more to raisins and prunes. The wine features the grapefruity notes on the palate. As for a qualitative assessment on my three star scale (0 being average, 3 being fantabulous), judgment reserved. "It's weirdly inconsistent. There have been bottles that have gotten sour. AND, last week in New York, at an event at the James Beard Foundation, the wine was the smash hit of the evening. The bottles we analyzed showed presence of lactobacillus, presumably the culprit." One taster found this to be reminiscent of "kerosene." Another described it as having some "Hydrogen sulfide fragrances, along with a lot of oak, licorice and butterscotch, but stinky." Someone else portrayed this as having "Heavy, heavy, heavy oak." Someone else felt it was "Extracted more than concentrated and it has an irrelevant amount of tannins...they're inappropriate for the amount of fruit." Another person described this as being reminiscent of "crushed berries with some smoked meat notes." I rather liked the lightly herbal and smoky fragrances. I felt the wine fared better on the palate than on the nose, having a richer oak character with nice fruit-to-oak in the mouth. I did note that the wine is a bit difficult to identify "blind" as Syrah. I gave it a one-and-a-half star rating. Parenthetically, we later opened a bottle of Jade Mountain's 1997 "Paras" bottling labeled P-10, some sort of "deluxe" or "best barrel" selection of 10 barrels from the 1997 vintage. This wine was a real oak bomb, having a lavish amount of wood. Identifying it as Syrah was impossible, but kudos to the barrel builders. $75 a bottle, too. "Off putting nose," said the lead-off batter in describing the newly-released MacRostie Syrah. Another taster found "Hydrogen sulfide" and someone else agreed, finding "mercaptan-like aromas." On a more positive level, one critic found "Berries, blackberries, fruity elements and a sweet, likeable character." Someone else found the wine to be "flat," with a "short finish and a bitter note." Another found a "malt" or "beer-like" character, while someone else said it's "sour." I found some pretty notes on the nose, missing those off elements others were, apparently, more sensitive to. I described this as showing berries, plums and cherries, with a slightly gamey note and a touch of citrus. On the palate I found some mocha or coffee notes in the form of a roasted quality. One star +. One taster criticized this for showing "Lots of oak and little else." Another pegged it as being reminiscent of Zinfandel, more than of Syrah. One person said "It's kind of dusty, with forest floor notes, dried bark, smoked meats but it's a bit tart and under-ripe." Someone else liked the "raspberry" character but added "it's sharp, thin and has no length." Another asserted "this tasted better than it smelled, showing a tar or burnt rubber note." I, despite my 7th place ranking, found some features of this wine to be intriguing. This has a lovely smoky, dusty quality with lightly herbal spice notes. There is an earthy quality here, showing some woodsy notes. I finally came upon a 'sharp' note on the nose and described it as 'rustic.' The rusticity is evident on the palate, the wine reminding me of some "old world" and "old styled" red wines. "This has good varietal character with lots of oak, some cherry/berry fruit, a touch of coffee and a silky texture. The oak is especially well-integrated with the fruit." said our lead-off critic. Someone else was positive about this wine, saying "I like the nose with its bacon-like undertone...it's better on the nose than in the mouth, though." A third person found some "spice notes...gentle...a hint of a vegetal quality, but nice body." The fourth vocalist found "stewed plums," while another fellow described it as "canned corn and it lacks complexity." One other person felt it was "high in acidity." I liked the attractive nose of sweet vanillin and berries, with a touch of plum. The vanilla and cocoa notes are rather attractive. The same elements come through on the palate, with a bit of blueberry, too. Very attractive. One-and-a-half stars. "Low intensity aromas with some sour and oaky notes." said one person. Another found it to be "tannic, but it has fruit. Also some licorice and cherry, grapey notes, but a bit hot." A third tasters felt it displayed "dark fruits and it opened nicely over the course of the tasting, It has enough fruit to deal with the tannins." A fourth critic didn't find it as full or rich as the others in this field, also noting a "bit of a Band-aid fragrance on the nose, along with some roasted notes." I wrote this shows some dark fruits with a touch of cedar and sandalwood, but a bit of heat from the alcohol. 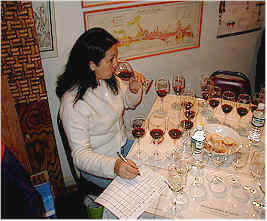 The wine is less woody than many in this tasting, with moderate tannins. One star. 2nd Place: RUSSIAN HILL 1999 Russian River Valley "Reserve"
With many fans, the Russian Hill Reserve was described as having "spicy, creamy, loganberry and lychee notes...some tart, cherry, vanilla and tamarind characters, too." Someone else found it to be "oaky and sharp." Another person noted "Herbaceous, spicy notes with nice oak, nice balance...this is the whole package." I was in agreement there, finding this to be rather nicely polished red wine. It shows lightly cedary notes and some vanillin and berry character, along with some fruitiness. The wine is quite nice on the palate, berries, oak and cedar. One star+. "An oak monster!" said the first critic. A second person described it as being much like the Russian Hill, but "buffed up." A third taster said "it's on steroids." A fourth person found this to show "Nice oak, a nutty and very long finish." Yet someone else said it's "balanced, with a blueberry nose and some maple syrup notes." One detractor found it to be "over-ripe, more similar to a Zinfandel and full of tannin. It's very 'oaked up'." I found some smoky notes and, yes, plenty of oak and cedar. There's a creamy, vanillin and woodsy quality to the fragrance. The wine is quite rich on the palate, again showing wood, vanillin and cedar. Like a number of others, I'd probably be hard-pressed to guess this, tasted blind, as a Syrah, but it is a mighty nice bottle of red wine.